Synthetic peptide, corresponding to a region within C terminal amino acids 901-963 of Human SART3 (Uniprot ID: Q15020). A431, H1299, HeLa, HepG2 and Raji whole cell lysates; HeLa cells; Human NCI-N87 xenograft tissue. Our Abpromise guarantee covers the use of ab155765 in the following tested applications. WB 1/500 - 1/3000. Predicted molecular weight: 110 kDa. Regulates Tat transactivation activity through direct interaction. May be a cellular factor for HIV-1 gene expression and viral replication. Defects in SART3 are the cause of disseminated superficial actinic porokeratosis type 1 (DSAP1) [MIM:175900]. DSAP1 is an autosomal dominant disorder, characterized by multiple superficial keratotic lesions surrounded by a slightly raised keratotic border, developing during the third or fourth decade of life on sun-exposed areas of skin. Cytoplasm. Nucleus speckle. Localized in speckles. Expressed in the nucleus of all of the malignant tumor cell lines tested and the majority of cancer tissues with various histologies, including squamous cell carcinomas (SCC), adenocarcinomas, melanomas and leukemias cells. However, this protein is undetectable in the nucleus of any cell lines of nonmalignant cells or normal tissues, except for the testis. Expressed in the cytoplasm of all the proliferating cells, including normal and malignant cells, but not in normal tissues, except for the testis and the fetal liver. Immunofluorescence analysis of paraformaldehyde-fixed HeLa cells labeling SART3 with ab155765 at 1/200 dilution. 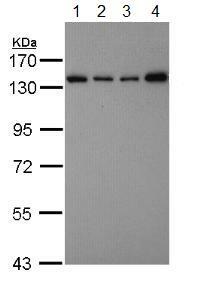 Lower image is merged with DNA probe. Immunohistochemical analysis of paraffin-embedded Human NCI-N87 xenograft tissue labeling SART3 with ab155765 at 1/100 dilution. ab155765 has not yet been referenced specifically in any publications. Publishing research using ab155765? Please let us know so that we can cite the reference in this datasheet. There are currently no Customer reviews or Questions for ab155765.